A United Nations panel has approved a temporary waiver for a series of economic sanctions against North Korea, in a move that will allow Seoul to bring equipment to the North for a joint inter-Korean excavation of the ancient palace site of Manwoldae in the communist state. The Ministry of Foreign Affairs on Tuesday confirmed that the UN Security Council committee for sanctions against the North had granted a waiver of the sanctions. The detailed list of equipment that would be allowed to be brought to the North has yet to be revealed, but it is likely to include trucks, excavator, and other heavy equipment needed for the joint dig and research on the Manwoldae site in Kaesong, North Hwanghae Province. Manwoldae is where the royal palace of the Goryeo Kingdom (918-1392) once stood, and study of the site is considered key to understanding the lives of Goryeo-era royals. Such studies have been limited because the ancient kingdom’s capital city of Gaegyeong -- now Kaesong -- lies in today’s North Korea. The two Koreas have held joint excavations and research of Manwoldae since 2007 -- an on-again, off-again project depending on inter-Korean relations. 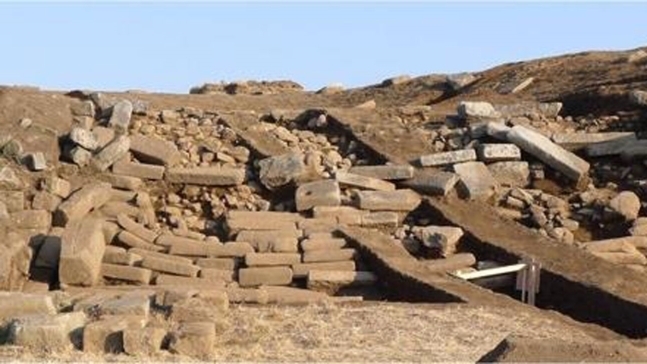 The excavation process has faced hurdles due to sanctions limiting the tools that can be brought into the North. Pyongyang is currently under international sanctions as punitive measures for its nuclear and ballistic missile programs. Although the UN decision would make the process easier when the dig resumes, it is unclear when that will be. Inter-Korean cooperation has stalled since the US-North Korea summit in February broke down. South Korea’s Inter-Korea Historian Association -- a civilian group leading the excavation – has since suggested resumption of the project to its North Korean counterpart but it has yet to receive any response. “Working-level talks are in order once we get a response. We (the CHA) will reconsider making the offer again since the UN granted a waiver. We would have to discuss it further with the Inter-Korea Historian Association,” the CHA official said. South Korean historians have hoped the joint research would be a step toward achieving historical homogeneity between the two Koreas. The two Koreas do not see eye to eye when it comes to history. For example, South Koreans consider the Silla Kingdom as the first to have unified the ethnic group of Koreans on the peninsula, while North Koreans deny this and put more emphasis on the Goguryeo Kingdom, which was based mostly on the northern part of the peninsula.